Ben Porat Yosef, homilies on Bereshit, with responsa at the end, by R. Yaakov Yosef HaKohen Katz Rabbi of Polonne. 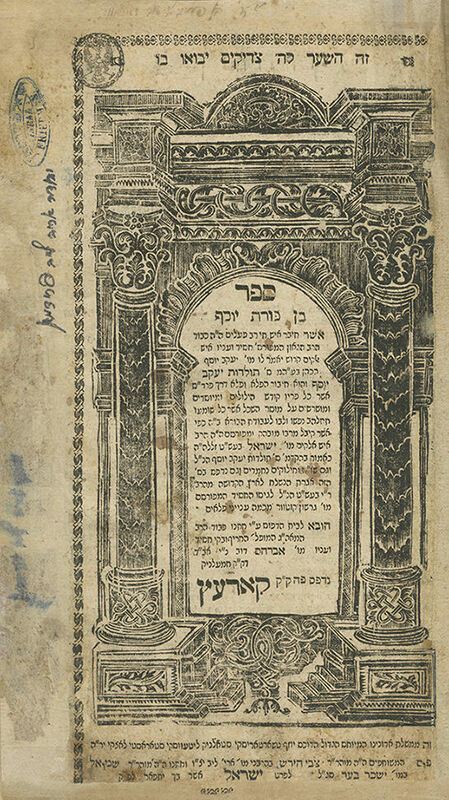 The famous letter which the Baal Shem Tov sent to his brother-in-law R. Gershon of Kitov is printed for the first time, at the end of this book. Korets: Tzvi Hirsh son of Aryeh Leib [Margolies] and son-in-law Shmuel son of Yissachar Ber Segal, . This is the author's second book, published approximately one year after his first book Toldot Yaakov Yosef. In this book, like in the previous one, the author quotes extensively teachings from his prime teacher, R. Yisrael Baal Shem Tov. At the end of the book, the famous letter which the Baal Shem Tov sent to Jerusalem, to his brother-in-law R. Gershon of Kitov, is printed for the first time. The letter was given to the author R. Yaakov Yosef of Polonne by the Baal Shem Tov, when the former intended to immigrate to Eretz Israel, in the winter 1752, so that he could relay it to R. Gershon of Kitov, brother-in-law of the Baal Shem Tov. After his travel plans were cancelled, the letter remained in R. Yaakov Yosef's possession, and his published it "to benefit the Jewish people". In this letter, the Baal Shem Tov narrates of the "ascent of the soul" which he performed on Rosh Hashana of 1746 and 1749, and relates: "And I asked Mashiach, when will the Master come, and he responded… when your teachings will be publicized and revealed to the world, and your wellsprings will spread outwards". R. Uri of Strelisk related that R. Mordechai of Neshchiz would study the letter every day: "The Tzaddik of Neshchiz resolved to study it every day, without fail, literally like laying Tefillin", he also said in his name that this letter contains allusions to three Holy names "through which one can find out the time of the Redemption" (Imrei Kadosh HaShalem, Jerusalem 1961, p. 47, 40). Stamp on the title page, of Rebbe Yisrael Friedman: "Isral Friedman ישראל פרידמאן". At the top of the title page, signature of a Chortkov Chassid who was a Shochet and Bodek in Shitova (Shatava): "Aharon son of Freida, Shochet and Bodek from Shitova" – who presumably gave the book to his Rebbe, and wrote his name with his mother's name (as in a kvittel) for prayer and blessing. Rebbe Yisrael Friedman of Chortkov (1854-1933), a prominent rebbe from the Ruzhin dynasty, foremost Torah scholar and Chassidic leader, founder of Agudath Yisrael and president of the Moetzet Gedolei HaTorah. Exceptionally holy and pious, he was a leading rebbe with thousands of Chassidim. He was the son of R. David Moshe of Chortkov, and son-in-law of his uncle R. Avraham Yaakov (the first) of Sadigura – sons of R. Yisrael of Ruzhin. Many illustrious Torah scholars were amongst his followers, including R. Meir Shapiro of Lublin, R. Meir Arik and R. A.M. Steinberg of Brody. Reputedly, the Beit Avraham of Slonim and Rebbe Avraham Elimelech of Karlin attested that he was the Tzaddik of the generation, through whom prayers ascend heavenward. During WWI, his court in Chortkov (Chortkiv), Galicia was destroyed, and he moved to Austria, remaining in Vienna until his passing. , 100 leaves. 31 cm. Fair condition. Stains. Dampstains to some leaves. Marginal tears to title page, affecting border (repaired with paper). Marginal tears to several other leaves at beginning and end of book, affecting text (repaired with paper). Worming (some repaired with tape). Stamps. New, elegant leather binding.